This chair— which may be the smallest of its kind ever created — is one of several artist-designed chairs that will be up for auction Saturday night at A Chair Affair. In 2017, the event raised more than $360,000 for the Boys & Girls Club of Rochester. "It's the smallest things that can make the biggest difference," says Rose Anderson, co-creator of the Petite Seat. Anderson says she and a team created the chair under a microscope at Mayo Clinic in Rochester. How exactly? We went straight to the source to find out. Here is our interview with Rose. How on Earth did you come up with this idea? The Boys & Girls Club of Rochester sent out a call for artists, inviting chairs to be submitted for their annual A Chair Affair fundraiser. I thought it would be a great opportunity to contribute in a creative way. When I saw that the chair concepts didn't have to be functional either, that was when I started thinking about how we might push the boundaries and try to make the smallest chair possible. My husband, Eric Anderson, and I got a few friends together for brainstorming and bowling and that is how Seth Nfonoyim-Hara, an engineer at Mayo Clinic, got involved, too. So many hands for such a small chair? This was a definitely a collaborative effort among our team of three — Eric, Seth, and myself. 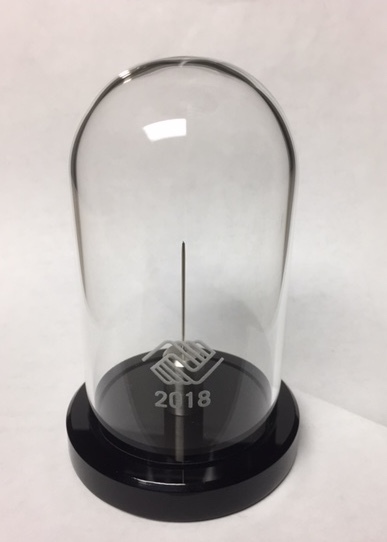 We were grateful for the Mayo Clinic Division of Engineering's support of this project, as well, and special thanks to Steve Anderson and Tyler King who custom-made a glass bell jar for us to display The Petite Seat. Tell us how you created this micro furntirue piece. We decided to carve the chair from the tip of a sewing needle using a femtosecond laser. First, I created a drawing of the chair and then we imported that artwork as a path for the laser to follow. (Well technically, first we got permission to use the laser from the Mayo Clinic Division of Engineering, which donated the equipment time for this project). It was a trial-and-error process as we figured out just how much precision we could get with the laser and how thin we could push the material, all while viewing it and double-checking our measurements through a microscope. While we were working in the lab we came up with a lot of ideas for names, mostly terrible puns, but The Petite Seat was what seemed to fit the best. Just how small is the chair? is it possible this is the tiniest chair ever made? It is about 540 x 360 x 380 microns. To give a sense of scale, 100 microns = the diameter of a human hair. We're hoping that we might be in the running for the tiniest chair, at least one fabricated using a subtractive manufacturing process. We've started the application process with Guinness World Records, so we'll keep you posted. When it goes up for auction, what is your pitch to a prospective buyer? A Chair Affair supports Boys & Girls Club programs for kids in our community and sometimes it's the smallest things that can make the biggest difference. The 16th annual A Chair Fair will be held this Saturday, Feb. 24 at the Rochester Event Center. All proceeds benefit the Boys & Girls Club of Rochester.